Homepage. 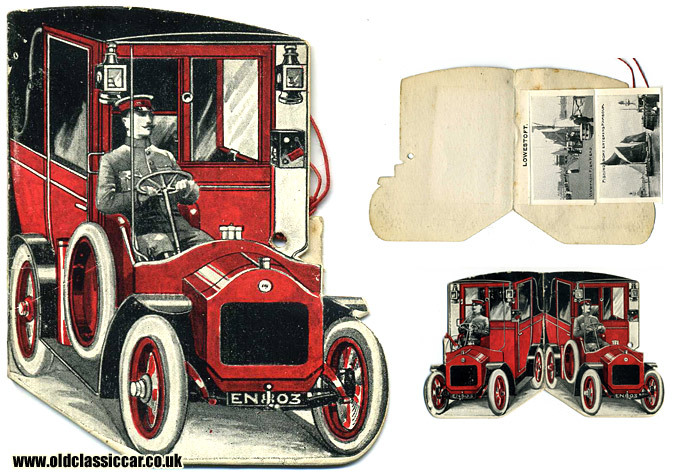 This page: A series of views of Lowestoft, folded within an early 20th Century taxi card. A veteran taxi card containing old photos. This must date to the earliest days of motoring, somewhere around 1905-1910 at a guess. This folded card measures approx. 3" wide by 3.5" high, and is shaped to look like an early taxi-cab, with the poor driver sat outside exposed to the elements. Note the spare tyre (not wheel and tyre) mounted to the offside of the driver's cab, forcing him to enter and alight on the passenger (kerb) side, and acetylene lamps. The registration is EN 803. Open this novelty card and inside is a pull-out collection of photographs, showing various scenes in the Lowestoft area. These include the Promenade, Oulton Broad, the Pier and Pavilion, the Swing Bridge, and the fish market. This novelty item was produced by The Photochrom Co. Ltd, of London & Detroit USA.